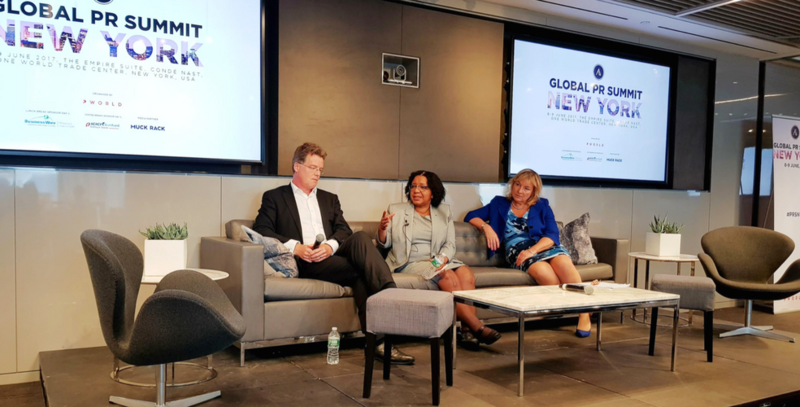 150 PR and communications professionals from the US and abroad attended the inaugural edition of the Global PR Summit New York that took place last Thursday and Friday at Conde Nast in the World Trade Center. The event kicked off with a keynote presentation by Lauren Day from Prudential Financial Inc who focused on the strategic importance of communications. “Our job is not to just cover the news, we try to predict the news”, she said in her speech. Data leaks and hacking were also covered heavily at the Summit. Piers Schreiber, Managing Director at Estragon in the UK emphasized that “choosing a spokesperson who understands technical issues is key when handling a hacking crisis”. He also shared that loss of customer data can result with 21% decline in brand value and it can take up to 12 months to recover. Colleen Harris, Former Press Secretary to Princes Charles, William and Harry emphasized on the importance of good content. “The public demands more meaningful content, transparency and visionary communications”, she pointed. The Global PR Summit NY was organized by P World, an international creative agency operating in 30 international markets. The next North American edition of the event will take place from 20-21 November in Toronto, Canada.